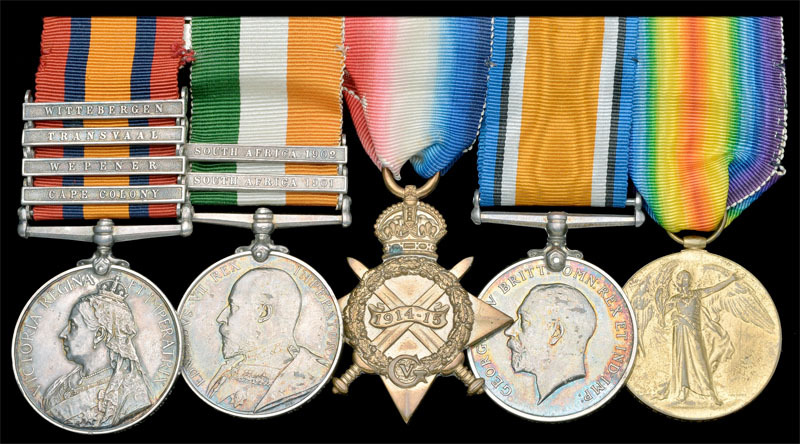 It is not often that you see medals to the Cape Infantry and not often that you see them with clasps. The appearance of the QSA to Serjt. A. J. Laws, Cape Infty. with CC and Wepener was therefore very interesting. Sadly, the excitement was short lived. Checking the rolls, his entitlement is to different clasps. The Cape Infantry roll (WO100/280p178) has no clasp entitlement. This is usual for the Cape Infantry where the roll shows the CC clasp crossed out for most men. He did serve in the CMR where he earned the CC clasp (WO100/241p40) and SA01 and SA02 (WO100/241p77) both with initials AG. This may be the same man but there is nothing to tie the two together on the rolls. It may be where his interest in the Wepener clasp came from? So it looks like his entitlement was to CC 01 and 02. Unless anyone can find his Wepener? This QSA to 68567 Corpl. A. Chandler, 151st Bty. RFA is the only Wepener QSA I have seen to the RFA. The roll does show him as having served in Kitchener's Galloping Maxims. The Royal Scots Wepener group to rgen (3336 Pte Edward Walters. The trio is named to the Royal Scots too. Good to see Chandler again!! It was one of the "stars" of my Boer War Artillery sub-collection. According to my notes it was in the Lovell Collection (I bought it in 1984) and prior to that in the Waite Sanderson Collection. I remember Chandler well! My father bought it at the Lovell sale in 1978 and it was in his collection until it went to yours! I would like to offer Mr Chandler a new home if he is willing. Perhaps I can recover from the failures of recent auctions in the south hemisphere?